With the holidays upon us, many of us are casting an eye about for unique gift items. The upcoming Olympic Art Festival, at the Olympic Art Gallery in Quilcene, is a good place to start. Doors open at 10 a.m. and stay open until 5 p.m. Many artists will be on site demonstrating their crafts as well as selling them. Charlie and Sally Brown: Gates, railings, hand forged home decor. Cider. It all starts with the tree (and the soil, and the water...). The Olympic Art Festival and Sale will also feature pieces from more than thirty other artists and craftspeople. All artwork is made by Pacific Northwest artists and is ON SALE, with discounts ranging from 10% to 30%. You may even find something for yourself. There’s a good chance you’ll be thirsty after the Art Festival / Sale. Several Olympic Peninsula Wineries/Cideries are offering special holiday tastings on December 11 and 12 from noon to 5 pm. Head to FinnRiver Farms in nearby Chimacum, where the Cidery Tasting Room serves certified organic hard and sparkling ciders. 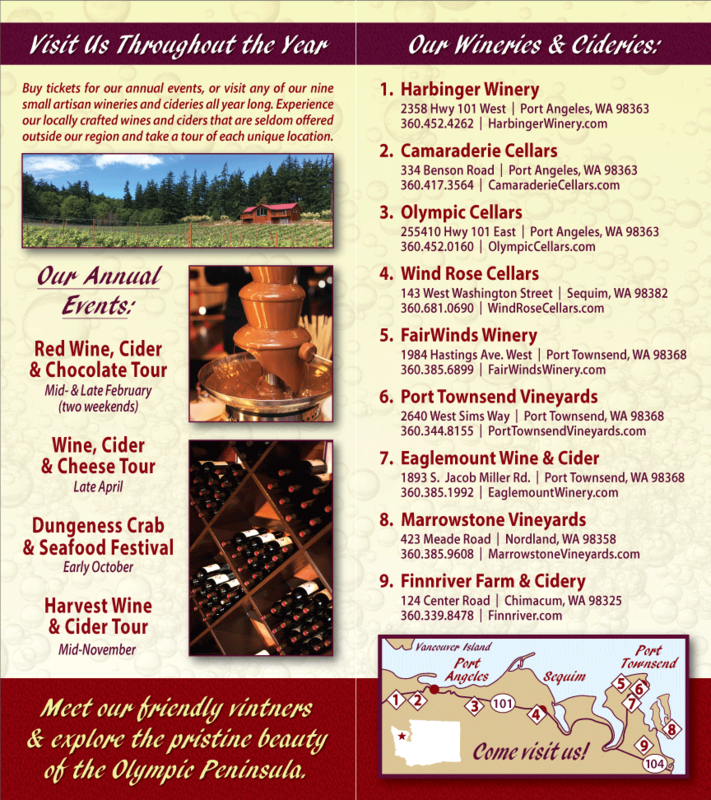 Washington wine and cider tasting is also available at nearby Eaglemount Winery in Chimacum. Both Eaglemount and FinnRiver use Washington state apples, including heirloom varieties. Continue up the road to Port Towsend, where Sorenson Cellars and FairWinds Winery are offering holiday tastings of Washington State Wines. Or head out to Port Angeles and stop by Olympic Cellars, Black Diamond Winery, Camaraderie Cellars, and Harbinger Winery. View this as another opportunity to shop for the holidays: a bottle of Washington wine or cider makes a lovely gift.